It’s Our 10th Anniversary Celebration & You’re Invited! For now until September 10th for travel through December 23rd, 2011, guests can save up to 40% on their ultra-luxurious stay at any of our Zoëtry Wellness & Spa Resorts throughout Mexico and the Dominican Republic. We’ll also throw in resort coupons for discounted resort extras. 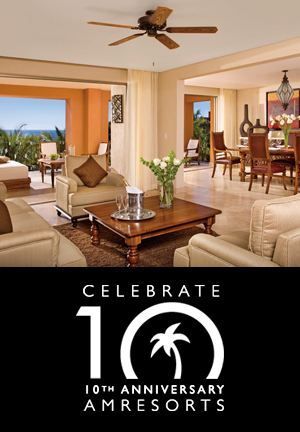 To top it off, stay a minimum 5 nights and enjoy our Celebration Package. Champagne breakfast-in-bed… now that’s a celebration! Here’s another opportunity for you to join the celebration! Enter now for your chance to win your very own 7-night stay in a Presidential Suite or highest room category at one of your favorite Zoëtry Wellness & Spa Resorts! Already reserved your stay? Enter for your chance to win an upgrade to the Presidential Suite or highest room category. This entry was posted in Zoëtry Agua Punta Cana, Zoëtry Casa del Mar, Zoëtry Paraiso de la Bonita, Zoëtry Wellness & Spa Resorts and tagged 10th Anniversary, 10th Anniversary Promotion, AMResorts, AMResorts' 10th Anniversary, Anniversary Celebration, Celebration Package, Dominican Republic, Mexico, Presidential Suite. Bookmark the permalink.